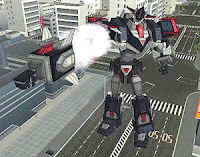 Robot Alchemic Drive (Gigantic Drive in its native Japan), an overlooked Sandlot gem from early in the PlayStation 2’s lifespan, puts players in control of a giant robot controller. You read that correctly: the player is not given control of a giant robot ,but instead given control of the one who controls a giant robot. 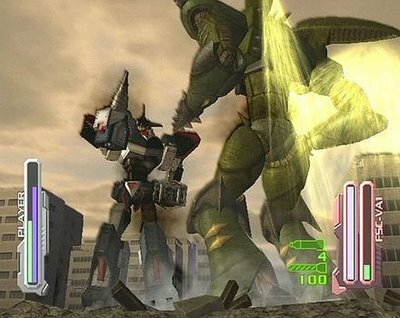 For adequate enough reasons in a videogame, Earth is under attack by giant biomechanical aliens and naturally the only defense against them is a big ol' mecha. 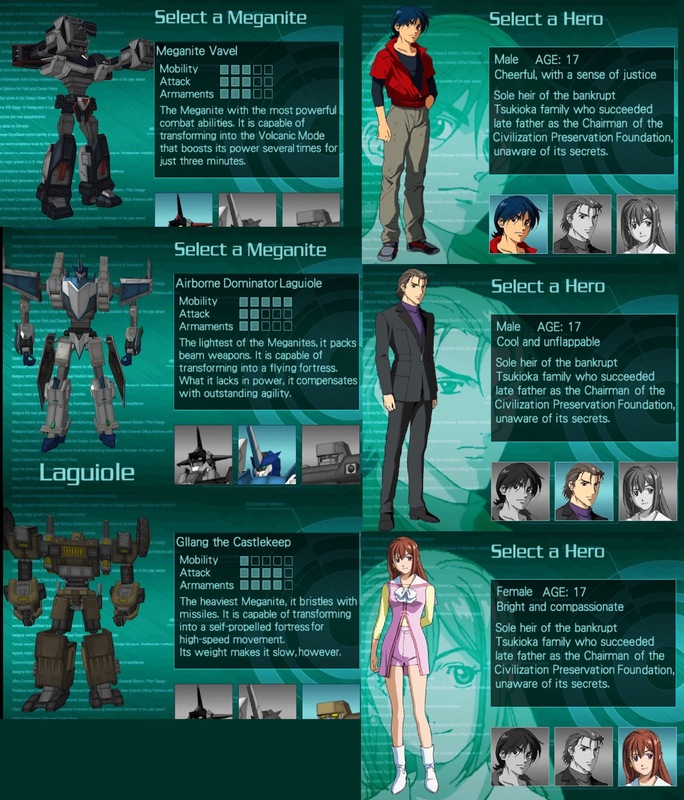 Since this is a Japanese game, the only people with command of a giant robot are three high schoolers. The melodramatic story is more or less an excuse to justify the gameplay. 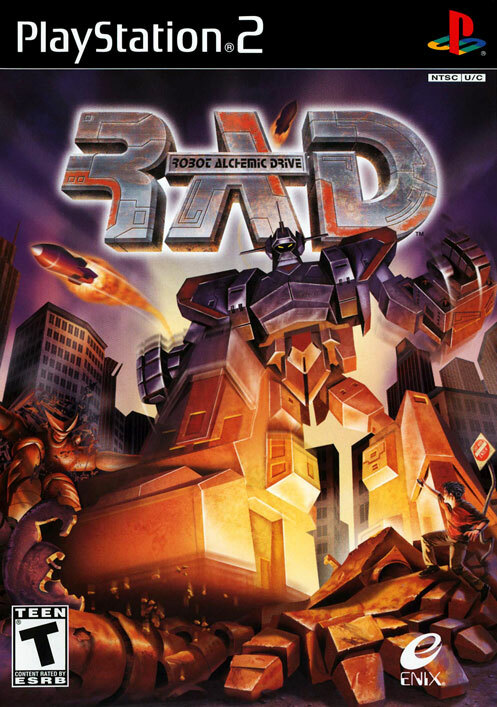 Once past the wrapper that is the game's narrative, the player is presented with the inner sweetness that is a gameplay experience unlike anything else (except of course for other Sandlot games involving robots). The crux of this gameplay relies heavily on one of gaming's essential yet oftentimes under-appreciated aspects: controls. What the game does splendidly is convey that you are in command of a space-age robot with incredible destructive capabilities This is done by having the Meganite, what the mechs are called, operate via remote control, and wouldn't you know it--that controller is a PS2 DualShock. An argument can be made that the best controls are those that do not remain in the consious thoughts of the player and seem to fade away. Yet Robot Alchemic Drive flies in the face of that line of thinking. At no point did I forget that I was holding a controller. Maybe this can be attributed to its simulator-esque approach. 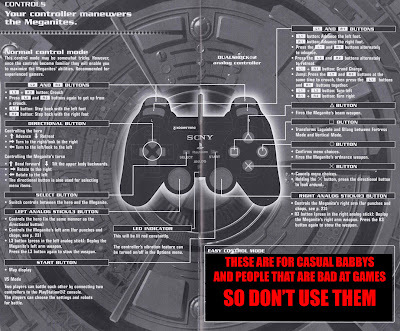 The best way to translate how this control of a controller controls (the Xzibitness of that phrases is not lost on me) a giant robot is that it is a 1:1 scale controller that forgoes the standard macro-like inputs found in most games. Direct control of the limbs are given to the player in a combination of different inputs. The legs are bound to the shoulder buttons with R1/L1 stepping forward and R2/L2 doing the reverse; walking is then an alternating series of R1 and L1 presses which undermines the now common assumption that tilting a stick directs your character in that direction. The arms are under the dominion of the analog sticks, and different stick motions result in different punches/attacks. This understandably cumbersome control scheme is partnered with equally lumbering iron giants that, while incredibly responsive to player input, still move without an ounce of grace, making it a game very different from Z.O.E. This might not be much of an issue in a Final Destination no-items match, but when you are trading blows with a kaiju in the middle of a populated urban center each misstep is another pricey insurance claim and potentially more lives lost. Which makes the player think carefully about each movement as well as plan one step ahead, as the consequences weigh heavily on the conscience of an ally of justice. You also control the human protagonist. These controls are not inspired or innovative like the robots', but they are an important aspect of the game that affects the control of the Meganites. Typically when controlling the human, the camera is in a third-person configuration. When you switch to control of your robot, the camera switches to the first-person perspective of the human hero. This usually means you will have godawful camera angles when you fight or maneuver your metal behemoth, which strains your depth perception and puts your aiming ability to the test. Getting atop the tallest building and using your totally sweet rocket shoes to survey the combat area becomes standard practice. When you are able to corral or successfully handle the enemy this isn't too much of an issue. If you are struggling with the fight, the camera won't be doing you any favors as you will have to constantly move your character and adjust your view in order to avoid being crushed by the rampaging titans. Poor cameras are motive enough to murder controllers, so it's not much of a stretch to assume that this would be an incredibly frustrating mechanic, yet it fits in perfectly with what the game is trying to accomplish and makes it difficult to find fault with the system. The overall control system presents a moderate learning curve that makes the early goings of the game somewhat difficult, but by the end of the game you should be a veritable Shotaro Kaneda; unsurprisingly, Sandlot would go on to develop a Tetsujin 28-go game. I was able to beat the final boss with about 85% of my health remaining. This wasn't the result of some pushover fight, but because I came to understand the controls and realized how to properly move and position my giant robo to deliver steel fists of justice. Finally my skill had developed to a degree that allowed me to land an Inazuma Kick as the finishing blow after missing with it throughout the game. 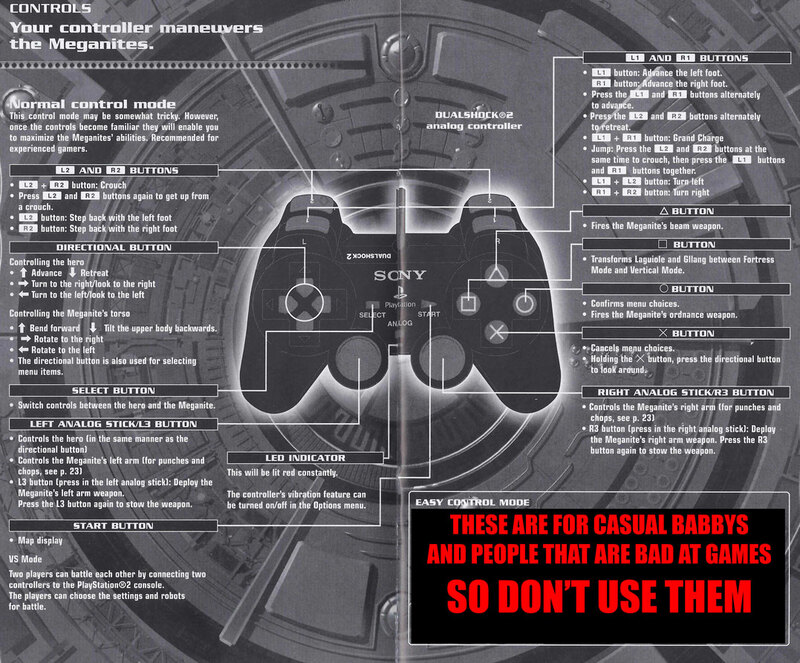 Awkward controls have enhanced other games too, and the best example of this is the survival horror genre. The "tank" controls and inopportune camera angles of Resident Evil fame helped to heighten a sense of helplessness which made the games that much scarier. Also, while Metroid Prime's first-person view might seem unintuitive for an adventure game so focused on platforming it resulted in what the proprietor of this blog called a "testament to the success of combining Japanese and American approaches to game design." Please do not misinterpret my words to imply that overly obtuse controls and camera management translates into good game design in all cases though. The last piece I wrote tried to pass off poor controls as some deeper commentary on videogames and those that play them, but at the end of the day they were just bad controls that contributed to Superman 64's mythic status as one of the worst games of all time. 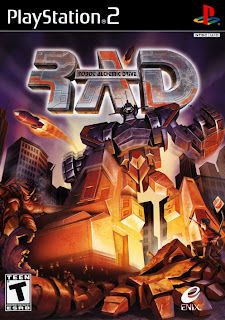 When all is said and done however Robot Alchemic Drive's application of these perhaps frustrating fundamental game mechanics stylistically fits the games overall aesthetic, and that is why it is super RAD. I couldn't think of a witty way to tie this into a discussion centered on the game's controls, so here you go a tasty treat for those of you that read through all of this.